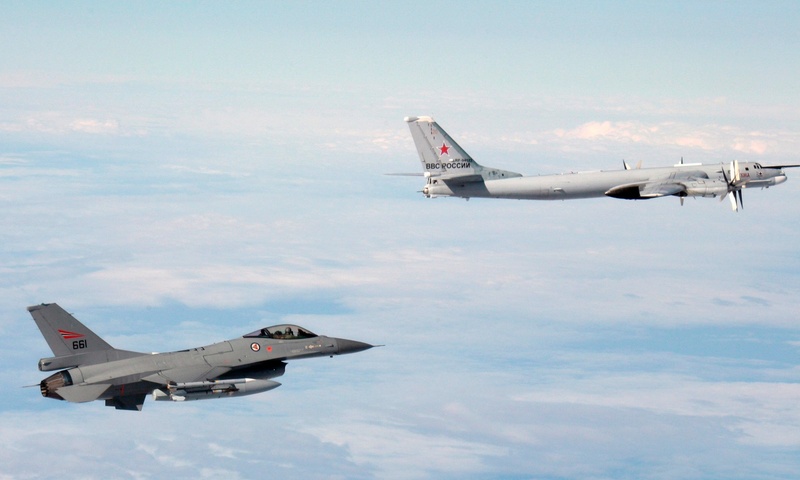 A Tu-95 Bear bomber is escorted by a Norwegian F-16 off the coast of Norway. Russian strategic bombers have stepped up patrols testing NATO defences in recent months. Sanctions never work. That is the consensus of opinion around the military hawks in Western military-industrial complex. To be fair, they have a lot of evidence for that – in Iraq, Zimbabwe and Serbia, sanctions failed (and continue to fail in Syria) to damage the dictators in charge of the country, instead merely harming the people who we hope to protect. Yet the sanctions imposed on Russia after their “support for Russian separatists” in Crimea and the Donbass regions of Ukraine, where many believe Russian troops are actively involved in a military attempt to alter the agreed international borders of a sovereign nation, appear to be working. Not on their own, but combined with a collapse in the price of oil, sanctions are having a direct effect in Moscow. Putin is having to decide whether to continue with his hugely expensive refit of the Russian military – replacing all that 1970s Soviet era kit with modern equipment – or to defer some of it in order to pay for ongoing operations. For instance, Russia was committed to buying 52 Sukhoi T-50 aircraft, their response to the F-22 Raptor stealth fighter. Yet in March they announced that they would instead be buying just 12, to allow the Russian air force to evaluate them and decide “how many they can afford to buy.” This may be, in part, related to India’s complaints that the plane is pricey, sloppy, under-powered and hated by their air force. The same has happened with the new Main Battle Tank. The Russian army was expected to take delivery of the T-15 Armata MBT, initially buying 2,300 of the powerful battlefield weapons. But at £4.4 million each they are significantly more expensive than expected. Russian Deputy Defence Minister Yury Burisov has already announced that the delivery is expected to be delayed, despite Putin insisting that all 2,300 will be delivered by 2020. Russia’s clear priority remains its nuclear force. Any cuts will have to come from the conventional weapons, because the Russian Navy is already being re-equipped and Putin announced only this week that they will take delivery of 40 new nuclear missiles. The navy has received a number of new nuclear submarines in the last couple of years, and the Borei class Alexander Nevsky shipped the full complement of 16 Buclava nukes. For the Russian military to keep on track with its ambitious re-equipment programme, given the 5% budget cuts the shrinking Russian economy has forced on them, there will have to be cuts in the operational budget. This will mean fewer Tu-95 Bear bombers skirting the edge of UK airspace, fewer massive exercises across Eastern Russia, and hopefully less support for the Ukrainian insurgency. None of this stops Vladimir Putin spending his time throwing his weight around. Ultimately the reason the West has done nothing about Syria is less to do with Ed Miliband’s “leadership” in the House of Commons and more to do with Putin insisting that we would regret overthrowing Bashar al-Assad. This week he has even announced that he will build a gas pipeline through Greece, which offers him no strategic benefit – except that Greece is a NATO partner and anything that drives a wedge between NATO, Europe and Greece helps Putin. But it does show that sanctions do work. Ultimately the West has to remember just how Ronnie & Maggie destroyed the Union of Soviet Socialist Republics. The USSR collapsed because the fragile command economy was unable to provide the funds to keep up that military edge. Capitalism has the ability to beat communisim in that way. But we can force Putin back in his box if we can keep his economy too small to build up his armies. We might regret it if we don’t.